My husband has lied three consecutive times on his financial. What can I do about the under-reporting of income and assets? Spouses that lie or under-report income are not uncommon in Divorce and Child Support proceedings. You have to bring whatever evidence you have of the under-reporting to the court’s attention. You should file a motion for further financial disclosure, which opens the door for a discussion of his finances in court. You can also use evidence of a life-style inconsistent with his reported income as evidence of under-reporting. My husband wants to separate. What do I do before he leaves to protect myself? Massachusetts does not have a comprehensive system for legal separation. There is one statute relating to legal separation in Massachusetts: it is the “Separate Support” statute, Massachusetts General Laws, Chapter 209, Section 33. The statute only addresses the issue of SUPPORT in a Massachusetts legal separation, and does not address property division or other issues that would be resolved in a divorce. However, custody of the children of the marriage can be addressed in an action for Separate Support, as it impacts on support issues. This section has traditionally been used by couples who were reluctant to obtain divorces due to their religious teachings or other considerations. A Separate Support action is a completely separate legal action from a divorce. If the couple separates under M.G.L. 209 and subsequently wished to divorce, it must be through filing a Complaint for Divorce. 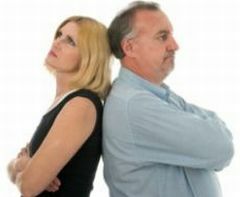 Generally, I would advise a divorce, rather than a separate support action, since the divorce addresses the full range of issues relevant to the dissolution of a marriage and particularly because it would place automatic “stays” (legally restraining the dissipation, sale or gifting) of all property. As part of the divorce you and your spouse (with the assistance of counselors) can try to work out a “separation agreement”. If upon review of the proposed separation agreement the court finds it suitable, fair and equitable, then the Court may approve and incorporate it into the judgment of divorce. If you fail to come to agreement, the court will –at its own discretion–render a decision on the distribution of assets after a trial. Your best defense is an offense! File for divorce immediately. Collect all information about your fiances: social security numbers, bank statements, investment accounts, retirement and pension funds, property deeds, income tax filings for at least three prior years, credit cards, etc. A modern divorce comes down to custody and support of the children, if any, and distribution of the marital assets–which in MA includes everything you own together as well as everything you individually own. So get a good lawyer to insure all your rights are protected from the start. This answer is provided for informational purposes only and it is not intended as legal advice. Additionally, this answer does not create an attorney-client relationship. If you wish to obtain legal advice specific to your case, please consult with a local attorney. Matta Law – the Law office of Estela Matta, Esq. offers a free half hour consultation.